That is significant considering the projected market size of $975 billion (Rs45.34 trillion) by 2013. IMS expects the near-term prospects for the US markets to have strengthened and expects the demand for low-cost generics to increase. That should be good news for Indian firms. Emerging markets are expected to grow by 12-14% in 2010 and by 13-16% up to 2013. India’s estimated growth has not been given separately but it will be one of the leading markets in this space. What about the short-term and the outlook for the September quarter results? In the pharmaceutical sector the questions usually asked are: how much did US generic sales grow; were there any milestone payments from research and development work; what is the impact of major generic launches and big contract research wins, and so on. Other issues are more company-specific. What is the probability of more pharmaceutical firms being acquired; which is next? 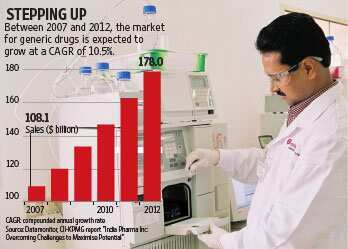 Will GlaxoSmithKline Plc acquire a stake in Dr Reddy’s Laboratories Ltd, as is being speculated? When will Ranbaxy Laboratories Ltd and Caraco Pharmaceutical Laboratories Ltd (a subsidiary of Sun Pharmaceutical Industries Ltd) resolve their regulatory issues with the US Food and Drug Administration? These are issues that have the potential to make a big difference to performance and valuations, although their timing and certainty are unpredictable. Most research houses are in agreement on the fact that a stable rupee-dollar rate during the September quarter will lower the mark-to-market losses for companies. Similarly, for companies in the CRAMS (contract research and manufacturing) segment, Emkay Research says, “We believe that this quarter would be a bottoming out kind of quarter for CRAMS companies and will see increased traction from Q3 FY10 onwards (from destocking to restocking)." Still, revenue growth is expected to be in low single digits, ranging between 1% and 5%. Some of the companies expected to report a better performance on both revenue growth and profits are Cipla Ltd, Dr Reddy’s, Lupin Ltd and Biocon Ltd. Aggregate profit growth is expected to be quite high, primarily because Ranbaxy will report a profit in the September quarter against a loss in the corresponding previous period. There is a wide degree of variation expected in the performance of different companies. But the positive bias for pharmaceutical stocks is evident from the BSE Healthcare index having risen by 11.6% in a month, while the Sensex is up by 2.63% in the same period.